It’s World Asthma Day today. It’s a condition that’s familiar to many Canberra families: in fact, there are around 2.3 million Australians who experience asthma on a regular or occasional basis. Asthma affects people of all ages — but with effective treatment and management its impact on lifestyle can be minimised. However, it seems that Australians are not great at controlling their asthma. “Good asthma control” is defined as the individual being able to sleep and exercise without limitation caused by asthma, to have few flare ups or symptoms and to enjoy normal lung function. However, an Asthma Foundation survey of around 700 participants in NSW in 2007 showed that only 33% of participants had achieved this goal, while 41% reported that their asthma was not well-controlled. This research also highlighted the negative impact that asthma can have on lifestyle when it isn’t well-controlled: many people take time off from work and school, there can be an impact on one’s ability to enjoy social occasions or to participate in exercise and sport. If you have asthma in your life, and it isn’t currently well-controlled, now is a great time to review your asthma management plan with your GP. As is often the case, asthma can also have an effect on an individual’s oral health. These effects are commonly due to the medications that are used to treat asthma. 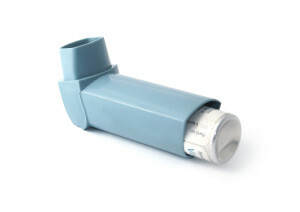 People with asthma often inhale their medications using a puffer: this device releases a dose of the medication in a puff of pressurised air into the mouth (and ultimately the lungs) of the individual. A (sometimes significant) portion of the dose can end up as a residue in the mouth, and this can cause inside of the mouth to become dry, inflamed and sore. This can have an impact on comfort, the ability to eat and ultimately emotional well-being. Some medications actually reduce the amount of saliva that is produced in the mouth, which directly causes a dry mouth. Dry mouth is a condition that can lead to the development of thrush in the mouth, as well as tooth decay and gum disease. It can also make it difficult to wear dentures and to eat. Asthma Australia recommends using a spacer so that more medication is inhaled directly into the lungs rather than landing in the mouth. A spacer is a clear plastic container shaped like a football or a tube with a mouthpiece or mask at one end and a hole for an inhaler at the other. Rinsing after using a preventer medication is often recommended: check with your GP or our dental team for a recommendation for your situation. You might also be interested in this checklist to manage asthma whilst keeping your teeth and gums healthy.